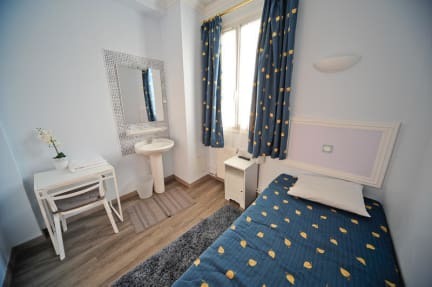 Perfect for those travelling on a budget, this two-star hotel can be found on Andre Gill Street, a little side street off of Martyrs Street, famous for its atmosphere, restaurants, bars, cabarets and concert halls (Michou, Madame Arthur, Le divan du Monde, La Cigale). The attractive paintings of Montmartre which decorate the hotel are the works of local artists on Tertre Square. Guests have a computer room, a TV room with DVD and a microwave at their disposal. Some of the guests may enjoy breakfast or even an aperitif in a pretty private courtyard full of flowers. 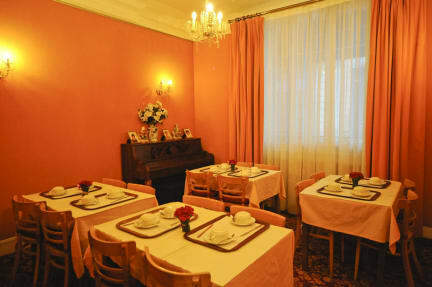 Ours is a simple, charming hotel in an excellent location. Ideally located, we’re just a few steps away from the Sacré-Coeur Basilica and Place du Tertre. It’s less than five minutes from here to the lively Pigalle district, Moulin Rouge and Grands Boulevards (Galeries Lafayette, Printemps) and not far from Champs Elysées and the Eiffel Tower. All the facilities you require are around the corner, such as supermarkets, laundry and shops. They’ll all be pointed out to you by our friendly staff!